The art of Chinese ribbon dancing is celebrated not only in China, but around the world as both dance students and others enjoy its beautiful style and ability to charm audiences all over the world. Chinese ribbon dancing is a traditional art form that originates in ancient China. Using sharp, rhythmic movements and long colorful ribbons, dancers are usually female and perform to traditional Chinese music. The ribbons and choreography are precisely synchronized so that the ribbons form patterns and designs in the air that are captivating to all who watch a performance. Anyone can get onto a community stage and twirl around a ribbon, however achieving the true art of Chinese ribbon dance takes practice, precision and perfection. When performing such a dance, you are representing an entire culture and a history of dancers, and this is a weighty responsibility. First, make sure you are using the proper type of ribbon for your dance. You can purchase your ribbons if you'd like to, but they are very simple to make. First, get a wooden dowel from your local craft store. You can get any length you want, but around 2 feet is recommended. 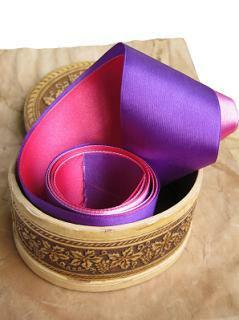 Then you need a satin ribbon. Unlike the dowel, which can be wood, plastic or fiberglass and you won't notice much of a difference, the ribbon must be satin for the proper aerodynamics during your dance. You can cut the ribbon to any length you like. Some are short - around 5 feet, and these are ideal for younger dancers. Others are as long as 12 feet, and these can be used beautifully by adults. As a general rule, your ribbon's width should be approximately 3 inches, regardless of length. Once your ribbon is attached to the dowel, you're ready to learn your dance. Listening to the beat of the music is the most important part of ribbon dancing's art. All twirls and tosses should be synchronized with the main rhythm of the song, and in traditional Chinese music you will usually find a very distinct melody to follow. The pace of your movements will also add an artistic feel to your routine. In general, large and flowing movements are ideal with slow music, so your ribbon will "float" above your body. However when the music speeds up, so should the choreography. Sharp and quick movements of the arm will give the look of fluttering and flapping that will bring an equal amount of beauty to your dance. Again, allow the music to dictate your motions and expressions. To stay authentic and professional-looking, be mindful of your ribbon at all times. Keep it off of the floor and watch out for knots as you dance. You'll want to practice many times before your performance, as this takes more strength and arm coordination as you may think. This is especially true if performing as a large group. While the upper body is executing much of the dance, dancers still must be aware of the lower half of the body; it's the lower part of the body that does most of the physical dancing (jumping, stepping and turning) while the upper body orchestrates the movements of the ribbon. Leaps, spins and even simple acrobatic moves such as cartwheels or somersaults can be used in Chinese ribbon dance. Especially with a children's team, you should take advantage of limber bodies and sprightly spirits, as this is the true epitome of Chinese cultural dance. If you would like to see Chinese ribbon dancing, check out fairs and festivals in your area that celebrate multiculturalism. Cities with a Chinatown such as San Francisco also hold periodic events that may include Chinese ribbon dancing. If you would like to form your own team, you can apply to perform at school assemblies, county fairs, or design and organize an International Day in your hometown. Chinese ribbon dance is a beautiful art and can be enjoyed by a diverse audience, regardless of age or nationality.